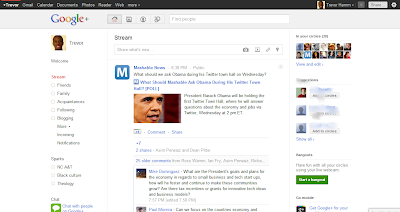 If you haven't heard, Google Plus (Google+) is Google's new social network. Right now it's in a testing phase, so you have to be invited in order to use it. I managed to get an invite from Tony Morgan last week and I've been exploring the site ever since. There's been alot of speculation about possible uses an applications for Google+, but of course, no one really knows what will become of it. I don't want to get ahead of myself with excitement. I remember how interested I was when I first got into Google Wave--and I remember the disappointment I had when it fizzled out. I get a different sense with Google+. Google Wave was confusing and difficult to figure out. 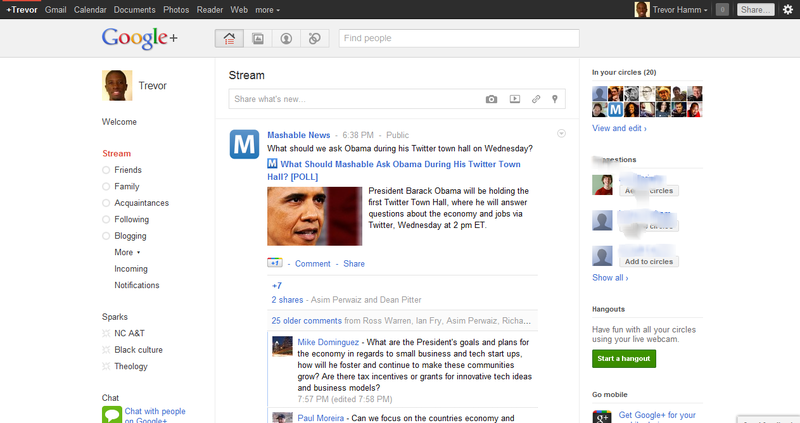 G+ is pretty intuitive and the clean interface makes you want to explore all of it's features. The general setup looks alot like Facebook, as you can see from the screenshot above. The Google "+1" button functions the same way that the "like" button functions on Facebook. Google+ is open, in the way that Twitter is. You can add anyone and anyone can add you. There are no "friend requests" so adding people or being added by someone else doesn't have to be reciprocated. Your stream consists of posts made by people in your "circles". Circles are Google+'s way of organizing your connections. By default there are circles for "Family", "Friends", "Acquaintances", and "Following" (for people you don't know personally). You can add as many circles as you want and you can put individuals in multiple circles. The most innovative features of Google+ are "hangouts" and "huddles". Hangouts are are basically video chats that you set up. If people in your circles happen to be online in G+, they can see your "hangout" and come chat. Huddles are text chats that you set up with people in your circles through the Google+ mobile site or mobile app. There is of course much more that could be said, but I just wanted to put down a basic overview. Since this is still in the trial/beta stage there will definitely be changes and improvements. So far I like what I see and I hope Google+ catches on once it goes fully public.